Here is a sequence of pics featuring three blokes who are fully engaged in their relationship with the sacred waters of the Ganges. Since I was a young Lad who read about the tradition of bathing in the Ganges, I have always wanted to visit India to witness the event...mission accomplished! Thank you for showing these images! I'm glad you've ticked one off your bucket list! Ray: This event did not disappoint me, Elizabeth. Il y en a même un qui vient chercher de l'eau avec un bidon, jolies photos. Ray: Beaucoup de gens emportent l'eau d'ici, Martine ... peut-être la ramener à la maison pour des rituels, ou peut-être pour un bain rituel d'un membre de la famille qui n'est pas assez bien pour venir au Gange. Many people carry away water from here, Martine...perhaps taking it home for use in rituals, or perhaps for a ritual bathing of a family member who is not well enough to come to the Ganges. You captured it well, Ray. You can tick that one off the list. A bizarre ritual. I wonder how many of 'em it kills? Ray: I am merely guessing, Chris, but think it possible the regular bathers quickly obtain the skin and gut flora on their body to deal with any nasties that might come from the water. Ray: I believe that is the correct term, Bill. You did not feel like engaging in the communal bath then Ray? Ray: There was a fleeting moment, Chad [see tomorrow] but I remained strong. I've just red a book about it, so fascinating! Ray: My experience of India [5 short visits] is that it is the most endlessly fascinating of places, Anne. A trio of good shots Ray. I would like to see it but no way would you get me in that water. Ray: Thank you, Brian. As you can see I was right down near the water on those wide steps, but did not throw off my clothes and jump in. I see a number of males participating in this ritual, Ray, but no females. Are they allowed to bathe here as well? It's good when "things to do before you get too old" get ticked off. I bet some of the people went home and had a good shower after bathing in that water. Ray: There is no such list for me, Alan, as I intend to never use age as an excuse for not doing. However...there is a list of things to do before I die...and this was on it. i see all manners of anatomy; from fairly round bellies to those with decent abdomens, Ray. i see there is a gent determined to get himself a jerry can of this water. 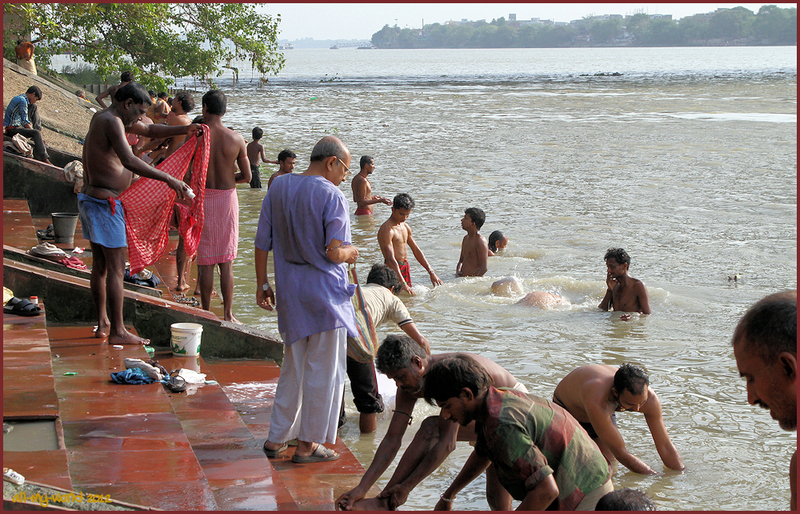 Ray: The public bathing ritual in the river fascinated me, Ayush...and I could have stayed to observe for hours if there was no schedule pressure [Kolkata in 5 hours! ].